Thanks to Blogie of Blogie Blog, I got wind of an entry by Jai on Blog, Oh Blog (B.O.B.) announcing a contest honoring Wordpress’ Fifth year anniversary where one gets to blog on THE contest. Okay, it’s like this: it is a contest that requires participants to blog about the contest. I know I’m being circuitous here, but just read B.O.B. to get a clear grasp of the mechanics. The B.O.B. contest outcome: Five winners of Five premium WordPress or B. O. B. 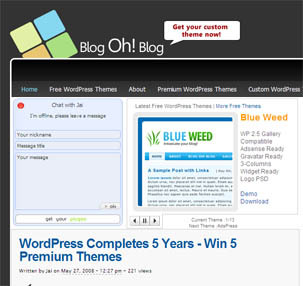 Themes for their blogs. Plus: One lucky winner will have the rare privilege of having their blog reviewed on B.O.B.—a US$300 value you may get for free just by blogging about the contest. Good deal, isn’t it? Nay, it’s irresistable! For someone who has been maintaining a free blog space on a free WordPress theme, who has been (silently) complaining about the limited possibilities of being CSS-deprived, a chance at having a paid-for PREMIUM theme is something definitely worth vying for. Well, not that I’m a pro at CSS codes; I usually learn the codes as needed. But anyway, the good thing about having a premium theme is to be able to modify your blog according to one’s own whim. And that’s a sure-fire way to take my blogging experience a notch or two higher than the current lackadaisical. If I should win, I will certainly consider purchasing a premium space on WordPress. It’s about time, perhaps, that this blog gets the much needed facelift it deserves. LOL. So, there goes my ticket! Thank you @ChiQ for this. This is exciting. Nice entry!!! your are my competitor for that contest on BOB… Good luck! !